Commuting via BART is the WORST. So worst in fact, that you're almost always gonna want a drink, like, the second you get off your train. That's why we put together this map of the best bar within a 15-minute-or-less walk of each and every BART stop (that actually has a bar near it). 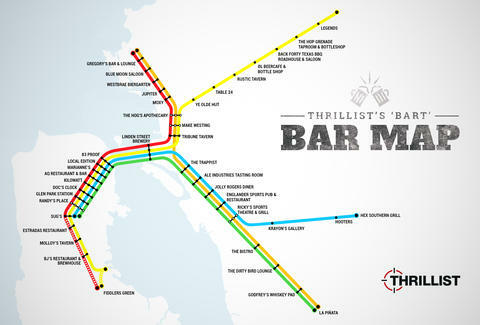 Enlarge the map HERE, check out a full list of the bars below, and if you're more of a Muni person, don't worry -- we've already got an SF Muni Bar Map for you, too. Daisy Barringer is Thrillist's SF Editor. Her Oakland friends wish she'd take BART more and now that this map exists, she just might do that. Follow her on Twitter @daisy to see if it ever happens.